I love spring time. The clocks have gone forward and the temperature’s on the rise, so we can finally shake off the cold, dark evenings of winter. Plus, there’s Easter to look forward to. But it’s not just chocolate eggs and Easter bunnies. 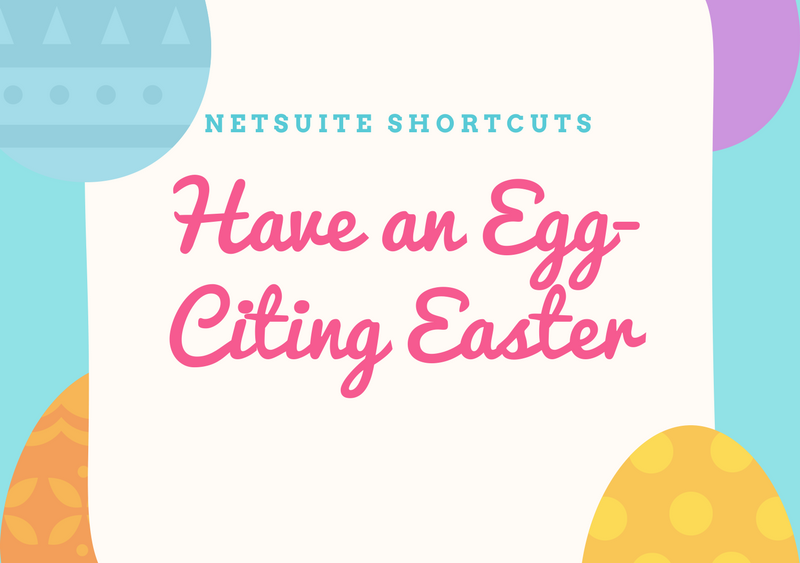 Sure we like our chocolate bunny ears, but sometime even better is little NetSuite Easeter surprises. Windows users are all familiar with the joys of ‘Ctrl + C’ to copy, ‘Ctrl + V’ to paste and ‘Ctrl + S’ to save. As insignificant as these keyboard shortcuts seem, they can make tasks less tedious, freeing up time to spend on other things. 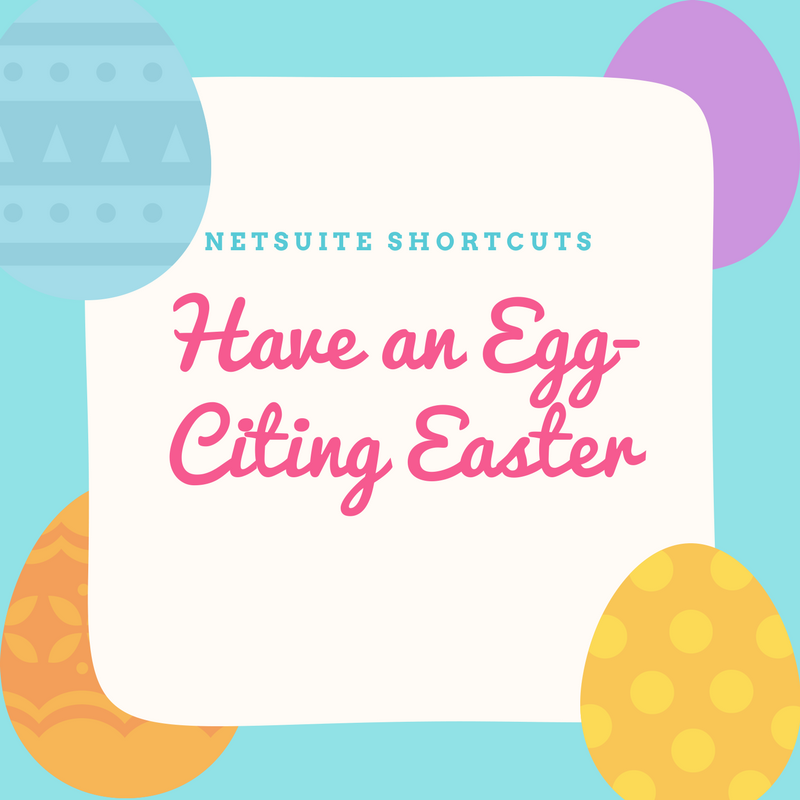 While NetSuite is based more on the premise of point and click, there are a few useful shortcuts that will save you time in your day-to-day tasks. Press T = Automatically fill the field with today’s date. Press Y = Automatically fill the field with yesterday’s date. Press Shift + t = Fill in tomorrow’s date. Press M = Fill in the last day of the month. Press + = Move the date forward one day. Press – = Move the date backward one day. Page Up = Go to the previous page of the report. Page Down = Go to the next page of a report. Home = Go to the first page of the report. End = Go to the last page of the report. Ctrl + F5 = Refreshes the current page you are on. This is particularly useful on the dashboards to refresh all of the charts, KPIs and reminders. Alt + G = Moves the cursor to the Global Search Field. You can use the global search field to search through everything in your NetSuite solution, however, if you know exactly what you are looking for it can be beneficial to filter the results. Insert one of the following terms into the Global Search Field before your search item to narrow your search down to a specific type, for example, inv: for invoice searches. When using tabbed pages, you can easily switch between subtabs with the following keyboard shortcut. You WIll notice that each subtab has a single letter that’s underlined in the title. Press and hold Alt and then press the corresponding letter to switch to that subtab. The cursor appears in the first field on the subtab. Just like any other skills, practice makes perfect so we encourage you to start using these today. As you spend more time using these shortcuts in NetSuite, you will get more familiar with navigating and naturally become more efficient. In a short period of time, you can learn to master these shortcuts and others to increase your skills with the platform. Make sure to share these tips with your colleagues to help them improve as well!